Watch Aranmula Boat Race 2011 will be available live on 14th September 2011 from 2 PM onwards. Read this article to know more about Aranmula Boat Race 2011. Here you will get informations regarding importance of Aranmula Boat Race, important events of Aranmula Temple, date of Aranmula Boat Race 2011, how to reach Aranmula? etc. 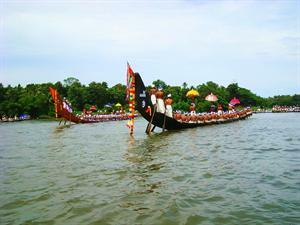 The Onam festival of Kerala is associated with snake boat races. Among the different snake boat races of Kerala, Aranmula Boat Race plays an important role in the history of Kerala. When we speak about Aranmula, the first name that comes to our mind is the Arnamula Boat Race. Aranmula is a place located in the Pathanamthitta district of Kerala state, India. This year the Aranmula Boat Race will be conducted on September 14. The Aranmula Boat Race or the Aranmula Vallam Kali is a boat carnival that attracts people from different parts of the world. Since this is associated with Onam festival, tourists from different parts of the world are attracted to the venue, which is the Pampa River located in Aranmula of Pathanamthitta district. So in simple terms we can say that this will also improve the tourism of our state. This Aranmula Boat Race is popularly known as the Aranmula Uthrattathy Vallamkali. This is called so as it is conducted on the Uthrattathy day of Chingam month. It should be noted that the Aranmula Boat Race is connected with the famous Aranmula Parthasarathy Temple & so it is believed to have a religious origin. In general terms remember that the Aranmula Boat Race or the Aranmula Vallam Kali is conducted to commemorate the procession of snake boats that were used in olden days to bring the food materials for preparing Onam feast at the famous Aranmula Parthasarathy Temple (Lord Krishna Temple). Inorder to watch this snake boat race, thousands of people gather on the banks of river Pampa. Remember that this is a two day event. So note that on the first day of the Aranmula Boat Race event, a water carnival is held with huge idol of Lord Krishna & children dressed like nymphs are held on the lake. On the second day, the snake boats carrying oarsmen, helmsmen as well as singers are assembled near the Aranmula Parthasarathy Temple. Here the oarsmen wear white mundu & turbans & they sing the traditional boat songs. No shirt & footwears are allowed for the people for getting into the boat. These snake boats are decorated with golden lace & silk parasols. The importance of Aranmula Uthrattathi Boat Race is that it is not conducted to win any trophies or prizes. Another important feature is that only men are allowed to be in the boats that participate in this boat race. Palliyodams are considered as the unique snake boats of Aranmula. About 30-40 palliyodams participate in this popular Arnamula Snake Boat Race. Several events are associated with Aranmula Temple on the Thiruvonam day & the Uthrittathi day. We all know the fact that Kerala people celebrate the Thiruvonam day with Onam Sadhya. Before going into the details it should be noted that Kattoor is an important place located in Pathanamthitta district of Kerala state, India. Celebrations at Aranmula begin only after the arrival of Thiruvonathonni from Kattoor temple with food items & an ever-burning lamp. Adults as well as children assemble on the banks of the Pampa river inorder to welcome this Thiruvonathonni. The snake boat race infront of the famous Aranmula Parthasarathy Temple will be conducted on the Uthrittathy day. Apart from this, the famous Ashtami Rohini Vallasadya is served to the oarsmen of snakeboats. This is usually done at the Aranmula Parthasarathy Temple premises, auditoriums & dining halls. The important items served are sambhar, resam, mango curry, munthiri pachadi, olen, pachadi, paal payasam, pacha moru, pulissery, ginger curry, chukka vellam, kaalen, kychadi etc. How you can reach Aranmula? Since Aranmula is the place where Aranmula Uthrattathy Vallam Kali is conducted, many people may be thinking abou the easiest way of reaching this place.The nearest railway station is that of Chengannur railway station & the nearest airport is that of Trivandrum International Airport. You can easily reach Aranmula by means of road, train or flight etc. Buses are also available from different places of Kerala state. If you are considering the bus route, note that Arnamula is located at about 125km from Trivandrum (capital city of Kerala), 10km from Chengannur, 50 km from Kottayam respectively. I have mentioned about the Chengannur railway station that is nearer to Aranmula. I hope most people are familiar with the Ernakulam-Kottaym-Kollam line. Remember that the Chengannur railway station lies on the above mentioned railway line. Some of the important express trains that run through this railway station are Kerala Express, Venad Express, Jayanthi Janata Express, Amritha Express, Parasuram Express, Sabari Express, Malabar Express, Chennai Mail & Vanchinad Express respectively. Uthrittathi Jalolsavam or Aranmula Boat Race will be Webcasting live on 14th September 2011 at 2:00pm onwards in the following website. Read about the science behind the superior imaging in aranmula kannadi. We all are familiar with the modern mercury or silver coated mirrors. But aranmula kannadi, a kerala science wonder works superior to the defects in the normal mirror. Read here the basic difference between aranmula kannadi and normal mirrors. Also give a glance into how aranmula kannadi tackles the optical problems such as aberration and secondary reflection by the help of its special engineering. Read about the science and history behind Aranmula metal mirror. The famous Aranmula Kannadi (Malayalam word for mirror), is a special mirror made of metal alloys. When ordinary glass mirrors, which reflect from the mercury, polished on the back surface, this particular mirror is made of bell metal and reflects from its polished front surface. Read this article to know more about Aranmula & Aranmula Kannadi. Aranmula is famous for Aranmula Snake Boat Race , Aranmula Pardhasaradhi Temple,Aranmula Kottaram & Aranmula Kannadi. this important place is situated in the Pathanamthitta district of Kerala. Read this article to know the types, models & importance of Aranmula Kannadi or Aranmula Mirror. Here you can also see the important ingredients used for the preparation of Aranmula Kannadi or Aranmula Mirror. Since the prices for Aranmula Kannadi is high, extreme care must be taken while buying it. That means don't get cheated. Aranmula Kannadi is a well known mirror made in Aranmula village of Kerala. This traditional mirror made by a rare composition of metal alloys had attracted lots of tourists. Aranmula Kannadi is one among best tourist picks in Kerala. Rare composition made for the preparation of mirror is still preserved as a family secret.